Thank to Earth's stable axial tilt, our seasons are highly predictable. But there's a planet out there called Kepler-413b that's wobbling so wildly, its seasons are in a constant state of flux. The planet, discovered by Kepler, spins around a close pair of orange and red dwarf stars every 66 days. It precesses, or wobbles, wildly on its spin axis, much like a child's top. Remarkably, the tilt of its spin axis varies by as much as 30 degrees over the course of 11 years, which is an extremely short amount of time as far as these things go. Normally, a precession effect like this isn't measured on human timescales. Because it's wobbling so badly, the planet experiences rapid seasonal changes that are highly erratic. It's like a Game of Thrones world come to life — except that it's a Neptune-like planet about 65 times the mass of Earth. Even with its changing seasons, the planet is too warm to harbor life. And because it orbits so close to its parent stars, its temperatures are too high for liquid water to exist. Kepler-413b's orbit is also a bit strange. Its plane of orbit is tilted 2.5 degrees relative to the plane of the star pair's orbit. Looking at it from Earth, the wobbling orbit moves up and down continuously. "Looking at the Kepler data over the course of 1,500 days, we saw three transits in the first 180 days — one transit every 66 days — then we had 800 days with no transits at all. After that, we saw five more transits in a row," said Veselin Kostov, the principal investigator on the observation. Kostov is affiliated with the Space Telescope Science Institute and Johns Hopkins University in Baltimore, Md. The next transit visible from Earth's point of view is not predicted to occur until 2020. This is because the orbit moves up and down, a result of the wobbling, in such a great degree that it sometimes does not transit the stars as viewed from Earth. 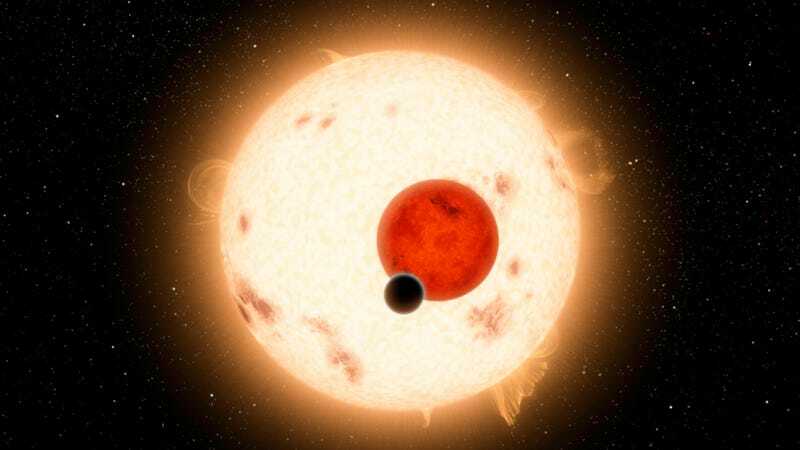 Top image: Depiction of the Kepler-16 system (unrelated to this discovery). Inset Image: NASA, ESA, and A. Feild (STScI).